This has now taken place. See the blog for some thoughts and reflections on the journey. The next pilgrimage walk forms part of an exploration of a trail to link South West Scotland and North East Wales, a proposal related to ancient routes of the immediate post-Roman period, especially St Kentigern (Cyndeyrn in Welsh, Mungo in Scotland). The pilgrimage will explore the possible routes through parts of Cheshire and Lancashire that could form a key connecting zone for the longer trail. The walk begins in Chester and finishes at the grave of a slave by Sunderland Point at the mouth of the River Lune. This walk will thus focus a neglected aspect of the history of the western seaboard that provided much wealth to Britain - the trading in humans in exchange for material goods and commodities. It is an ancient and continuing issue. Many fortunes and regular incomes in North Wales and Lancashire were based on a this trade. It was at Sunderland Point that the first bales of cotton were imported into England. This specific theme is related to the one of the major aims of the whole route - to encourage multi-cultural and multi-faith groups to interact through the creative activity of planning and then travelling together in a purposeful but leisurely manner, especially by walking. 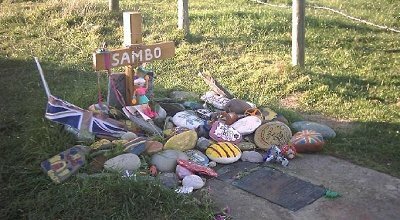 The grave site to the slave - called ‘Sambo’ - is bleak and desolate, situated on the edge of a salt marsh. It is increasingly recognised as a place of importance both because of its original position outside the bounds of ‘normal’ society and because it became a focus for abolitionists at the end of the 18th century. The route provides some considerable contrast and highlights much history - ancient and modern. Recent widespread action to reclaim former industrial sites have created a a variety of significant environmental and heritage landscapes through which the route passes. These include the largely forgotten disused Sankey navigation (pre-dating the more famous ‘first’, Bridgewater, canal, former tramway routes over the Ribble into Preston and considerable sections of footpath that formed part of the ancient western road to Scotland (now followed by the A49 and the A6). The walk will take place during Easter 2010 (early April). The early planning for this walk has created a series of clearly defined sections. The accommodation being arranged (the usual village and church halls with sleeping ‘on the deck’ and the group sharing responsibility for all catering) will decide the final length of each day but it is intended to keep to a maximum of around 10 miles per day. The whole journey will take around 12 days.